An international team of scientists has discovered new relationships between deep-sea temperature and ice-volume changes to provide crucial new information about how the ice ages came about. Researchers from the University of Southampton, the National Oceanography Centre and the Australian National University developed a new method for determining sea-level and deep-sea temperature variability over the past 5.3 million years. It provides new insight into the climatic relationships that caused the development of major ice-age cycles during the past two million years. The researchers found, for the first time, that the long-term trends in cooling and continental ice-volume cycles over the past 5.3 million years were not the same. In fact, for temperature the major step toward the ice ages that have characterised the past two to three million years was a cooling event at 2.7 million years ago, but for ice-volume the crucial step was the development of the first intense ice age at around 2.15 million years ago. Before these results, these were thought to have occurred together at about 2.5 million years ago. The results are published in the scientific journal Nature. Co-author Dr Gavin Foster, from Ocean and Earth Science at the University of Southampton, says: “Our work focused on the discovery of new relationships within the natural Earth system. In that sense, the observed decoupling of temperature and ice-volume changes provides crucial new information for our understanding of how the ice ages developed. The team used records of oxygen isotope ratios (which provide a record of ancient water temperature) from microscopic plankton fossils recovered from the Mediterranean Sea, spanning the last 5.3 million years. This is a particularly useful region because the oxygen isotopic composition of the seawater is largely determined by the flow of water through the Strait of Gibraltar, which in turn is sensitive to changes in global sea level – in a way like the pinching of a hosepipe. As continental ice sheets grew during the ice ages, flow through the Strait of Gibraltar was reduced, causing measurable increases in the oxygen isotope O-18 (8 protons and 10 neutrons) relative to O-16 (8 protons and 8 neutrons) in Mediterranean waters, which became preserved in the shells of the ancient plankton. 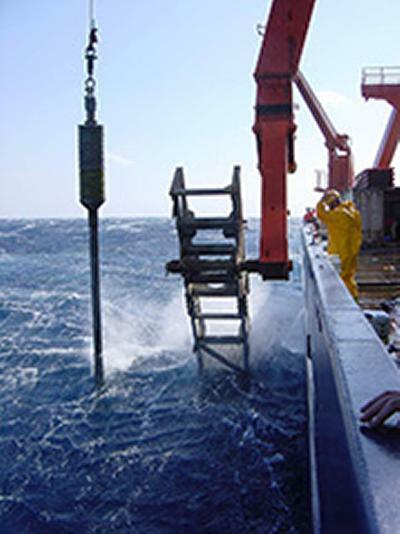 Using long drill cores and uplifted sections of sea-floor sediments, previous work had analysed such microfossil-based oxygen isotope records from carefully dated sequences. The current study added a numerical model for calculating water exchange through the Strait of Gibraltar as a function of sea-level change, which allowed the microfossil records to be used as a sensitive recorder of global sea-level changes. The new sea-level record was then used in combination with existing deep-sea oxygen isotope records from the open ocean, to work out deep-sea temperature changes.